This western series premiered on CBS on September 10, 1955 and completed its network run on September 1, 1975, making it the longest running dramatic series in the history of television. 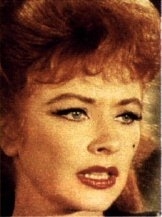 Two of its stars, James Arness and Milburn Stone, stayed with it through all 20 seasons, while Amanda Blake departed the series after 19 years. Although it started out as a half-hour show, it was expanded to an hour beginning with its seventh season. 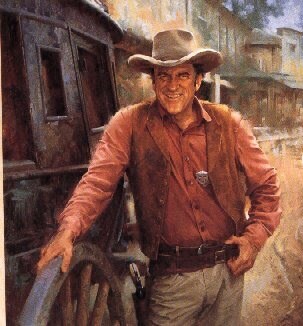 "Gunsmoke" was one of two TV series that introduced the "adult western" to television audiences. (The other was "The Life and Legend of Wyatt Earp," which premiered the same week). Prior to "Gunsmoke," shows depicting the wild west were conceived around fantasy characters, such as the Lone Ranger and Hopalong Cassidy, holdovers from movie and radio serials. "Gunsmoke" originated on radio in 1952, with William Conrad playing the role of Marshal Matt Dillon. When CBS decided to create the television version, Conrad was deemed to hefty for the part, yet he continued in the radio role until the early 1960s. The role of the marshal was initially offered to John Wayne, who was not interested in doing a weekly series, yet he did introduce the first broadcast of the program. "Gunsmoke" centered around the exploits of Dillon (James Arness) in the frontier town of Dodge City, Kansas in 1873. 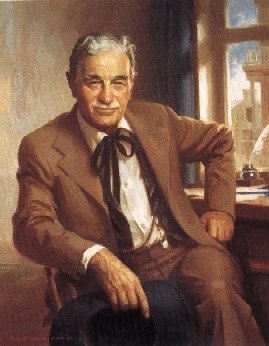 His kindly companion was Doc Adams (Milburn Stone), the town physician who spent many hours chugging beers at the Longbranch Saloon, owned and operated by the shapely Kitty Russell, who was always attracted to the marshal (but never actualized this into a romance). Over the years there were several changes in the supporting cast, most notably the replacement of Matt's loyal deputy Chester Goode (Dennis Weaver) with hillbilly deputy Festus Haggen (Ken Curtis). "Gunsmoke" started the trend for TV westerns, which ultimately led to there being 30 of them on the air at one time. However, it outlasted all of them and at the time of its cancellation in 1975, it was the only show of its kind still on the air.